Brassbound's Conversion , 1971, The Constant Wife , 1973, and Waters of the Moon , 1977; 1982—star of TV mini-series Golda based on life of Golda Meir. 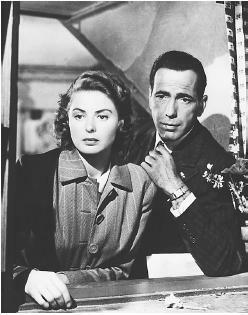 Awards: Best Actress Academy Award for Gaslight , 1944; Best Actress, New York Film Critics, for Spellbound and The Bells of St. Mary's , 1945; Best Actress Academy Award, and Best Actress, New York Film Critics, for Anastasia , 1956; Best Supporting Actress Academy Award, and Best Supporting Actress, British Academy, for Murder on the Orient Express , 1974; Best Actress, New York Film Critics, for Autumn Sonata , 1978. Died: In London 29 August 1982. Ingrid Bergman: My Story , with Alan Burgess, New York, 1980. "Ingrid Bergman on Rossellini," interview by Robin Wood in Film Comment (New York), July-August 1974. Interview with Ingrid Bergman in Michael Curtiz's "Casablanca" , by Richard Anobile, New York, 1975. Steele, Joseph Henry, Ingrid Bergman , 1959. Quirk, Lawrence J., The Complete Films of Ingrid Bergman , New York, 1989. Spoto, Donald, Notorious: The Life of Ingrid Bergman , New York, 1997. Tynan, K., "The Abundant Miss Bergman," in Films and Filming (London), December 1958. Vermilye, J., "An Ingrid Bergman Index," in Films in Review (New York), May 1961. Ross, Lillian, "Ingrid Bergman," in New Yorker , 21 October 1961. Bowers, R., "Ingrid Bergman," in Films in Review (New York), February 1968. Bourget, J.-L., "Romantic Dramas of the Forties," in Film Comment (New York), January-February 1974. Damico, J., "Ingrid from Lorraine to Stromboli: Analyzing the Public's Perception of a Film Star," in Journal of Popular Film (Bowling Green, Ohio), v. 4, no. 1, 1975. Waldman, Diane, "Ingrid Bergman: An Outcast Returns" and "A Nun Does Not Fall in Love with an Italian" in Close-Ups: The Movie Star Book , edited by Danny Peary, New York, 1978. "Ingrid Bergman," in Ecran (Paris), April 1978. "Rossellini's Stromboli and Ingrid Bergman's Face," in Movietone News (Seattle), December 1979. Harvey, Stephen, "Ingrid Bergman" in The Movie Star , edited by Elisabeth Weis, New York, 1981. Amiel, M., obituary, in Cinéma (Paris), October 1982. In The Annual Obituary 1982 , New York, 1983. McLean, A.L. "The Cinderella Princess and the Instrument of Evil: Surveying the Limits of Female Transgression in Two Postwar Hollywood Scandals," Cinema Journal (Austin, Texas), no. 3, 1995. Campbell, V., and C. Oakley, "A Star Is Born," Movieline (Los Angeles), no. 7, June 1996. Jacobowitz, F. "Rewriting Realism: Bergman and Rossellini in Europe, 1949–1955," Cineaction (Conde-Sur-Noireau, France), no. 41, 1996. The core of Bergman's achievement is in her work for two of the cinema's greatest filmmakers: the three films for Hitchcock, the five for Rossellini. Both, again, drew on the persona, inflecting it in quite different ways. Spellbound (the least interesting Hitchcock) reconstructs the natural Bergman out of the repressed psychiatrist. Both Notorious and Under Capricorn achieve great resonance by playing upon the possibility of the persona's irreparable degradation (through heavy drinking and promiscuity in the former, alcoholism and potential insanity in the latter) and its eventual, triumphant rehabilitation. The Rossellini films are still disgracefully underrated, even largely unknown, outside small circles of initiates; they are essentially films about Bergman (though they are also about much else besides), obliquely relating to her personal situation. Stromboli places the lady, as a displaced person, among the physical and emotional brutalities of a primitive community and explores her reactions; Europa '51 begins by abruptly demolishing the facade of elegance and sophistication that represents one aspect of the lady and proceeds to release the natural side of the woman and develop it towards sainthood; Viaggio in Italia reunites the lady with George Sanders in all the sterility of a respectable bourgeois marriage and proceeds to show her reaching out to make contact with eroticism, death, and the terror of emptiness, as a necessary movement towards the discovery of meaning. Bergman herself did not greatly value her work in these films: she didn't "act," she "walked through them." Yet they constitute the essence of her own meaning, as star, presence, actress, image.